Like anything in life, it’s the little things that can make a big difference. This also applies to rental properties. First impressions matter to tenants. This means that every part of your property needs to be in tiptop shape, not just to get the perfect tenant, but to see each property turn faster than average. The good news is that many of the things that may turn off applicants can be easily fixed. Here are the top 5 exterior maintenance tips to consider to help rent your property faster than average. Curb appeal can make the biggest difference when it comes to attracting quality tenants. If the property doesn’t look appealing at first glance, people won’t stop to look. 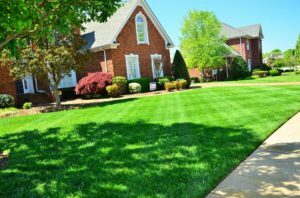 What you do doesn’t have to be high-maintenance, but giving your lawn a clean trim weekly can improve your property’s value dramatically. Aeration and fertilization should be done twice per year. Much like lawn care, if the first thing a prospective tenant sees is a poor looking exterior, they may consider looking elsewhere. Instead of painting the whole complex or house, try pressure-washing to see if that will be enough to give the property a cleaner feel. It’s surprising how easily gutters can become clogged and filled with debris. It takes only a few leaves or pine needles to create a blockage impermeable enough to prevent water from flowing down the spout. Ideally, you should have any debris removed from rain gutters after each season. At the very least, try to clean the gutters out at least twice per year. Otherwise, misdirected water can cause significant damage to the home over time, such as stained siding,rotting fascia boards, flooded basements, deteriorating landscaping, and even foundation problems. Many property owners take the “if it’s not broken, don’t fix it” approach when it comes to sprinklers. While most sprinkler systems are relatively low maintenance, they still require seasonal attention. Winterizing the sprinkler system is important in keeping the pipes from freezing. This process involves blowing the water out from the pipes, so if they freeze, no water remains in the pipes. Come springtime, you’ll be ready to service the sprinklers for the summer. One of the most important things you can do to keep all your maintenance in order is to have good communication with your whole team. This can help solve problems before they start. The responsibility of keeping each property in pristine condition is ultimately up to the property manager. By following this maintenance checklist, each property is sure to accommodate tenants faster than average.